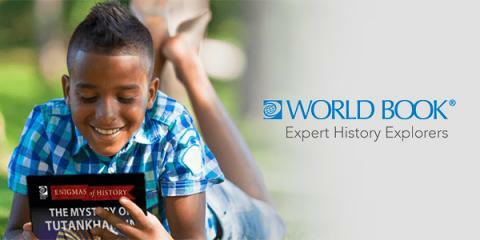 World Book and Swagbucks have the perfect gift for the little reader in your life - a free book that makes history come alive! World book has a great assortment of vibrant, fun, and informative books about a variety of different historical events, people, and legends that are perfect for grades 6-8. This offer gets you a free book (you pay $1 in shipping) AND you get $5 (paid in Swagbucks' SB Points) for doing it, plus a bonus $3 (300SB) for signing up for Swagbucks through me first. 1. Click here to get to the offer. When you get there, if you're not already a member you'll be prompted to create your Swagbucks account - it takes less than 30 seconds. 3. Order your free book - that's it! The 500 SB will credit immediately, and if you're a new member signing up for Swagbucks through the above link, you'll get another 300 SB in the first week of December. So, what's this Swagbucks I'm talking about? It's the site where you earn points (called SB) for things you're already doing online, like shopping, watching videos, discovering deals (like this one! ), taking surveys, or even searching the web! Then you take your points and redeem them for PayPal cash or gift cards to places like Amazon, Walmart, Target, Starbucks, and more! In fact, for signing up through me, you can actually get ANOTHER bonus $2 if you spend $25 or more on holiday shopping through Swagbucks this month! I currently earn between $25 and $50 each month and it really adds up. Once I redeem my Swagbucks for a prize, it usually takes less than a week for them to arrive in my inbox. I'm always impressed with how quickly they send our rewards. I "bank" and save my rewards all year long and redeem them for "FREE" Christmas gifts for the kids! The kids are always thrilled with their gifts and I'm happy that I was able to stick to our holiday budget and not break the bank!